Nonprofits, political movements, social good organizations, churches, communities; anyone who wants to raise money with a simple yet robust solution. Donately is trusted by over 1,000 orgs to grow their impact through online fundraising. 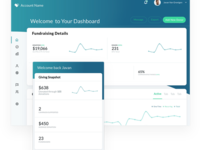 Our top features include simple donor management, custom donations forms that can be embedded into your site, beautiful donation pages, support for recurring donations, automatic donation receipts, & robust integrations via Zapier. Give donors the option to pay via credit card or bank transfer, and allow them to cover donation fees. Plans start at $0/mo + 4% and are designed to grow with your organization. Pros: Price and ability to embed on my site. Cons: Limited donation tracking and donor outreach tools. 1. You pay per donation processing fees, which are reasonable. There is no monthly fee. This makes it possible for small NGOs to accept online donations without it costing us an arm and a leg up front. 2. You can easily embed the donation form into your own website. This allows you to keep the brand of your organization and legitimizes your group because you don't send folks to PayPal or Network for Good or some other third party processor. Other than that the service is ok. I think they are updating some of their online donation tracking tools, automating some email responses, and such, but it isn't the most advanced in those features if that's what you're looking for. For instance, there is no way to automate a message to donors if their donation doesn't go through and they need to update their credit card. The donation email confirmation options are also pretty limited but we've managed to make the confirmation email look ok and work for our purposes. We use Zapier to help us track donations into Google Spreadsheets. We don't use the Fundraising pages really, but those are options and they do have peer to peer functionality. Ultimately, the service is perfect for us. It accepts donations on our website and doesn't have a monthly fee. And the customer service is amazing. I've worked personally with them a few times and they are always so personable and helpful, available via chat right through their site. Definitely recommend. Recommendations to other buyers: Good customer service. Overall: Hello donate.ly! We have been so much happier with your service now that our congregants can manage their own giving. This is huge! One thing that's been difficult is figuring out the best way to export data from donate.ly, say, to a spread sheet. We've not been able to do this successfully and it makes life more difficult. Recommendations to other buyers: It would be helpful if donate.ly connected easily to database software so we could have a profile for each person who donates with snail mail address, notes, etc. Thanks for your response. We're glad you're on Donately and we're happy to help solve any of the issues you're experiencing. You can export any donation or donor data from your Donately dashboard. See this article for more information (http://help.donately.com/all-things-donations/donation-data/exporting-data). Additionally, if you go to Settings -> Account Admins, you can sign up for emails when recurring donations fail. Pros: Extremely easy for our customers to use! Cons: Not the best at allowing us to view all donors and donations at once. Sometimes the filtering is really slow. Form codes cannot automatically update on our website and have to be completely replaced after making a change to the form. You can only link one bank account to where the donations to go. Overall: This site allows us to easily collect donations for our non-profit organization. We are in the process of exclusively using this site to collect donations in conjunction with Stripe because it is so much better than any other site we have ever used. One con is that donation form codes have to be completely updated on our website, rather than just updating them through Donately and having them automatically update on our site. Pros: Easy. user friendly. continues to improve. Cons: Some functionalities are not totally there that we would like. For example If I'm a long term giver to someones fundraiser Id like to print our my end of year giving report or a selected date range. On the Organizations side I can do this but on the givers side not so much. Overall: Over all great company they took us from a prehistoric out dated giving software to something social media friendly, ascetically pleasing and a platform our highly valued volunteers can actually use! Thanks Donately for changing our lives! Pros: Easy to use and easy to communicate! Cons: Not as clear on how donors can re-access their log-in. We have had donors accidentally create multiple accounts which then can't be merged into one. Overall: Coming into using Donately, we didn't really have anything else to compare it to as this is our first go at an online donor database. But anything we haven't liked, your team has been so willing to try and implement the changes as quick as possible. We LOVE that you all are so easy to get ahold of. Cons: Could use the ability to be able to have a drop down box for people to select specific options for where their money is being used. Meaning the client and pick for their money to be used for a specific project within the numerous we have. Overall: We were loosing donations due to our clients problems with Paypal's support of immoral policies. I didn't know what to do, I didn't know that other options existed. Then I found Donately, not only did my clients appreciate us not supporting bad business practices, but I found Donately to be 10x better and more functional than Paypal. It's easier to use, cleaner and crisper. I wish I would have known about them in the first place. I for one can say with 100% certainty, Donately is just better! Recommendations to other buyers: Nope :) You guys are great! 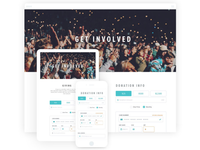 Pros: Donately is a fantastic tool to use for small non-profits. It is affordable and helps better manage donations. The web forms are also attractive and I like the custom options for email automation and receipts. Donately easily integrated with Stripe and was set-up in no time. Cons: I was there was more options for sending automated emails after donations and getting notifications to multiple email addresses. Overall: Donately has definitely helped us get the most out of our donations. Donately allowed us to set up an easy and nice looking web form on our site and effectively helps us manage donations. Pros: We can create forms to accept donations and can customize the form accordingly. It is able to share the campaign easily to reach more people. There is no monthly fee or other hidden fees, just only a processing fee charging per donation which is really helpful. Cons: Need more support to Asian Countries. Not getting any notification when recurring donation stops. Need features to customize the donation page more. Overall: It is really helpful service to NGOs and Start-ups. The features and support from staff, leads me to recommend this to worldwide users. Overall: Just wish there was a pre-prepared package that allowed for immediate integration with the top 10 crs programs such as Donor Perfect. Recommendations to other buyers: Not at the moment. Comments: Water is a source of life and its distribution and management should abide by the values of equity and social justice. Equity alludes to notions of distributive and procedural justice and transparency. Equity in water implies the right to a minimum amount of water for basic human needs plus the assurance of procedural fairness and transparency in the provision of this basic human right. YLP attempts to recast water YLP related policy and research to address the vulnerabilities likely to be accentuated by water related disaster. Contemporary water resource planning frameworks are based upon normal conditions continuing into the future. A YLP approach aims to build societal resilience in water related extreme events, such as droughts and floods, by treating extremes as part of the normal continuum of human environment relations.Young League Pakistanis encouraged to become lifelong learners, active participants and resilient, accomplished and confident contributors. Movement for Water Equity in Pakistanrun by Young League Pakistan, with a consistently fine record of achievement. It is also a place where citizen are taught to value spirituality, hard work, friendship, compassion, integrity, good humor, self-discipline, loyalty and community service. Small nonprofits may benefit big! Pros: Coming from the nonprofit industry, I am no stranger to fundraising software. I've used Donately in a program assistant capacity. A cool thing is that you don't pay monthly. You pay per donation, which helps small nonprofits (this could also be a con for some). However, focusing on larger, fewer gifts rather than a bunch of little ones -- the per donation fee wasn't horrible for us. Having this tool made us more legit rather than relying on PayPal or a common third party app. Cons: Customer service could be improved, but thankfully we didn't have too many issues. Pros: Great value for money, awesome support. Cons: Great if we can do multi-currency as we are a global org. Also if it can note down it is Xth recurrent donation somehow it can make our backend record keeping better. Overall: We were drawn to Donate.ly because we are rebuilding our online donation and for the volume of expected donations it made a lot of sense. Our backend CRM is salesforce and so we needed to use Zapier to create opportunities and contact records. Bryan Shanaver was quite helpful in getting that set up for us. I want to give features and functionality a 4 but no doubt it will get there with a more advanced recurrent donation logging and foreign currency, a 5 would be non-cash gifts. Make no mistake though it is great value for money, so as they grow I am sure it will be well made. I would recommend it for small to midsize non-profits at its current form. Recommendations to other buyers: It is quite handy with Zapier to integrate with your CRM. Cons: Hard to take to the next level without help. Overall: Donately has been pretty good to us so far. I like the simplicity of it. I'd give it four stars in terms of simplicity of use because of the need to be a bit more technically savvy to be able to modify the donation pages and what not. We haven't gotten there yet and the improvements we need to make haven't been done because of the need to get high tech assistance. I think if that process were easier, then the lack of advanced controls would be more easily surmounted. I haven't had issues with customer support, but haven't needed much. Recommendations to other buyers: make it easier to connect with people who can make the modifications we need for a reasonable price. Cons: Entry pricing is steep. Overall: The customer support has been fantastic, always offering a solution any setback I face. As an admin, the back end dashboard is easy to use and free of distraction. Recommendations to other buyers: You're doing great so far. Adjusting our few to 1.5% as a NPO was appreciated as we scale to that million. We'll get there in about 18 mo. The email follow up to setup an account for users could be more forward and clear, instead of a link in the footer as an after thought. Overall: Its been okay and it does serve its purpose. Customer support is slow especially when you're trying to have a conversation with someone to answer all your questions. Forms aren't able to be customized which is especially disappointing with campaigns and peer to peer fundraising. There should be more templates for options on both the campaign and fundraiser angle. More importantly I wish there was a way that our campaigns could stay on our site and not bounce to the donately url. This serves its purpose and isn't horrible and given that the other options out there are massively more expensive then this seems like the right option for smaller non profits. Thanks for filling out a review! Sorry that there was some aspects of Donately that you felt needed work. The good news is that we take your suggestions very seriously and we are always trying to make Donately better. Per customizing the donation forms, by using the form embed you essentially have full control. If you are using our free hosted pages I'm happy to say that we'll have all the embed form features available there as well, in the next few months. Per more campaign types, you're speaking our language there - that's a major push in 2017 for us. We will have various options to choose from. Per bouncing to Donately from your site, I don't understand that one. 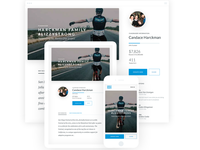 One of the main features of Donately is the ability to embed the donation form on your site - and not send them to your free pages on Donately. Love the company/service! Software could be better! Cons: Lack of integration with PayPal. Overall: We have had a great experience with people at donately! We had a couple of issues early on in the process (our fault) that were attended quickly by a real human which was great! The software is missing some functionality that would make it so much better. PayPal integration would be amazing but even Deeper integration with swipe would ok. A mobile app for events would kill all birds with one stone for us. After my experience with other platforms, we recommend donately all the time and are loyal customers. Recommendations to other buyers: Can't wait to see what it grow into. Hope you don't lose your heart like some other platforms in the process! Pros: It's simple to use and has a clean, but versatile presentation that suits our needs. It meshes well with the rest of our site, making the user feel as though they are interfacing with a trusted and safe donation platform. Overall: Donately is an extremely user friendly platform and we are impressed with the UX as well as the customer service provided when needed. - the donation receipts are really ugly and poorly throughout. They need actual customization. 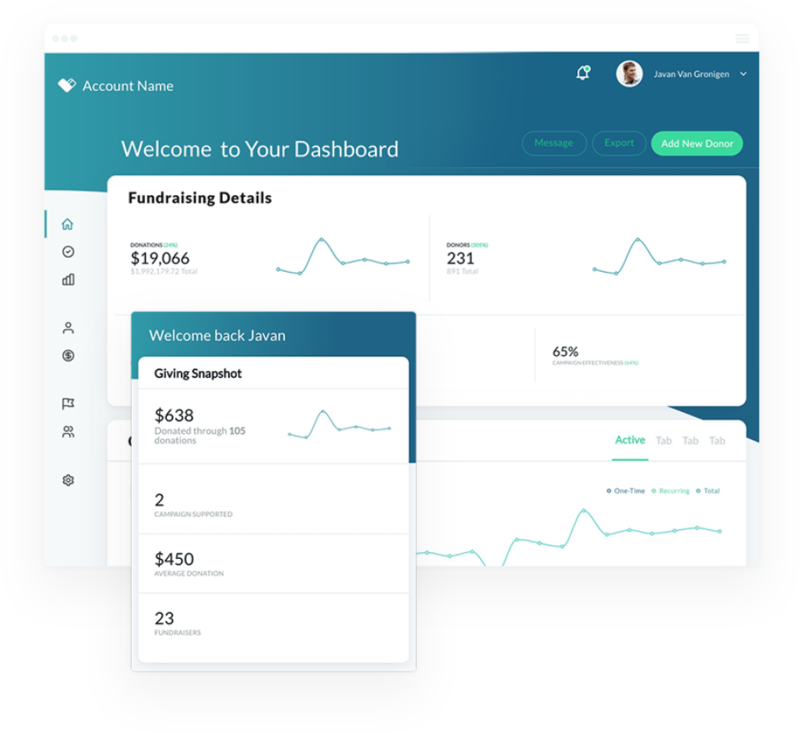 - there needs to be a fundraising progress widget you can customize from donately and embedd in your website. 1. The giving form you are able to embed on your website has a very clean and simply visual design while many other competitors look clunky. 2a. The percentage fees are the lowest and therefore best you can find on the market. 2b. There is no monthly fee, so you are only charged when you get an actual donation. Easy to use-seamless way to raise funds! Pros: SImple, easy to use, able to create multiple campaigns for ongoing donor involvement, low fees, able to have reoccurring donations. Easy for DONOR to access and sign up! Best reason is our donor love it. Cons: I do not to not have the option to turn off the donors ability to see how much funds are raised and the goal. Its great for special project, but if we are raising support on an ongoing basis, I would like to have a main account and the ability to have other small campaigns for special projects. Overall: We tried many site to help us raise funds, but many were complicated and costly. This has been a seamless way to achieve the financial goals we have with minimal upkeep. Overall: It is great for our fundraising to take a team to England for a rugby tour. We are taking 46 players, coaches and parents to England for a rugby tour in July 2017. Donate.ly gives us a great option to collect payment via credit card and payment plans. Pros: Clean, simple interface. Extremely easy to implement on websites. Overall: I've done a ton of research for our nonprofit, and I like donate.ly because they do not charge a monthly fee, they hook up to my existing stripe account, and although their fees stack up more than other alternatives, their interface is so incredibly simple and easy I have found that if just ONE more donor is gained BECAUSE of their easy interface It pays for the fees for an entire year! Also it's incredibly easy to implement on a website. No HTTPS security certificate needed Though highly recommended of course! Recommendations to other buyers: Looos great on a WordPress site! Comments: Donately is so simple and straightforward that I can't imagine anyone having too hard of a time using it. It is also simple and straightforward on the front-end, making donating a cinch. It integrates well with Stripe, though I would like to see PayPal integration. Pros: It was easy to set up for our team, even for a rookie like myself. I had it easily set up and we started receiving donations almost immediately. The graphs and visuals really helped us to see how we were doing and to see where most of our money was coming from. Cons: As convenient as this is, for us it still does not replace traditional fundraising, a lot of people in our community prefer good old cash donations so this program was not necessarily as useful to us as we had hoped. Pros: Integration and powerful feature set. Cons: Difficulty plugging in API. Overall: I've used this as the donations platform for several clients and they all love the ease of use and feature set. Overall: Overall, Donately has been a great experience. It's overall very user-friendly; however, I do believe there are certain aspects that could be even more simple for those who are not good with tech stuff in the administrative department. Recommendations to other buyers: I don't have any advice. Pros: Easy to use and cost effective. Overall: I have never had any problems or difficulties and feel like it's a great interface for my nonprofit. Pros: It's quick to customise a secure page which you can embed on your website. Cons: It only supports USD at the moment but look forward to international currencies becoming available. 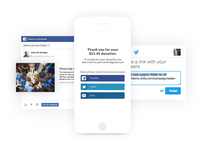 Overall: Donate.ly lets you accept one-time and recurring donations using an easy to configure platform. Fees are a very reasonable 3-4% depending on your use-case. It's quick to customise a secure page which you can embed on your website. It only supports USD at the moment but look forward to international currencies becoming available. Recommendations to other buyers: Fees are a very reasonable 3-4% depending on your use-case. Pros: Cost. Integration. Clean design. Overall: I love the fact we can create our donation form and in minutes embed it into our website. No other product offers this level of seamless integration. For small and medium-sized nonprofits with resourceful teams, Donate.ly is the perfect product. We don't need a lot of hand-holding. What we need is reliable, cost-efficient products that provides appropriate acknowledgments to donors. Donate.ly's product's do just that. Recommendations to other buyers: If you need a mobile responsive donation form, this is your tool. Excellent Service took our fundraising to a new level! Pros: Donor Profiles, ability to incentivize fundraisers. Cons: Wish it would integrate with our ticketing software. Overall: Before Donately - we were running all of our fundraising through several different systems that didn't integrate. Switching over to Donately made it possible to properly track our donors and fundraising campaigns. Pros: It's just easy and we don't really need to think about if our money will get to us. Cheaper than paypal, too. Overall: Very easy and minimal amount of work to do on our end. Like the summary downloads we can call when we want to review all donations. Great way to raise donline donations! Overall: This has helped out ministry raise awareness to our cause and take online payments. Highly recommend for anyone looking for a payment database online. Pros: Great customer service. Looks great on our website. Easy for users to sign up. Cons: Some limitations on software. Cannot personalize reciepts. Cannot merge contacts. Users who send in checks cannot see their donations online. Overall: The thing we like best about Donate.ly is how great their customer service is! They answer our questions the same day that we ask them. Being a small nonprofit, this is extremely helpful as we grow. Donately has been a real plus for our nonprofit! Comments: Rwanda Children, the nonprofit I serve, has been using Donately for almost two years. Like all nonprofits, we are always on the lookout for ways to stretch or donor's dollars... and Donately has helped us accomplish that. First and foremost, Donately initiated a reduction in their fees charged to nonprofits. This shows me I'm dealing with good-hearted folks! Secondly, they consistently deliver quality service to us by taking great care of our donors. And when our donors have encountered problems (and these have been few and far between) Donately's customer support has been outsanding. Rwanda Children is benefited by our partnership with Donately, and we look forward to that partnership continuing! Pros: They are great for setting up a donation page for your nonprofit that only charges a percentage fee. Cons: I would like if they had a bit more functionality for white labeling and inserting into the website. The only way we were able to figure out how to insert the donation form into our wix website was by using a module that imported an html page. This worked fine but still had donately's branding so we had to put a white block over the top of the module to make it truly white labeled. All over it does the job though. Pros: The interface is nice and clean. Super easy to use. I love the option for donors to set up a recurring donation! Cons: It would be nice to be able to pull reports for the year or longer if necessary. Also, it would be nice to get some sort of alert/notification if a donor's recurring payment was not able to be processed. Cons: To be able to hide some donors. Ease of running reports. Overall: Some features could be improved. Not easy to run reports. Also would like the feature after fund raising pages are archived to go away from dashboard view. But still be able to call up if needed. Overall: I really enjoy using Donately as a way for our supporters to donate directly to our cause. I love being able to see a list of people who have donated. I never have had any supporters complain about difficulty or anything of that nature! Overall: We use Donately on a Squarespace site to receive donations for a year-long fundraising campaign. Integration with Squarespace was a breeze. The form looks great out of the box and had all the styling customizations needed to make look like it was a part of the site. We had zero issues during setup and have had zero issues with both one-time and recurring payments. The application has many features to suit our needs and their support response time has been less than 24 hours, and often within a couple of hours. Combination of setup ease, overall feel of the application, and helpful support make this a no brainer. Comments: We are very pleased with the Robly service and are happy with our move from Constant Contact. It is easy to use and we feel as though the value for the money is superb. Overall: Donately has been very easy for us to use at Akola! We appreciate how it captures information and messages from the donors. Pros: The low cost of this software is probably the most attractive piece of it all. 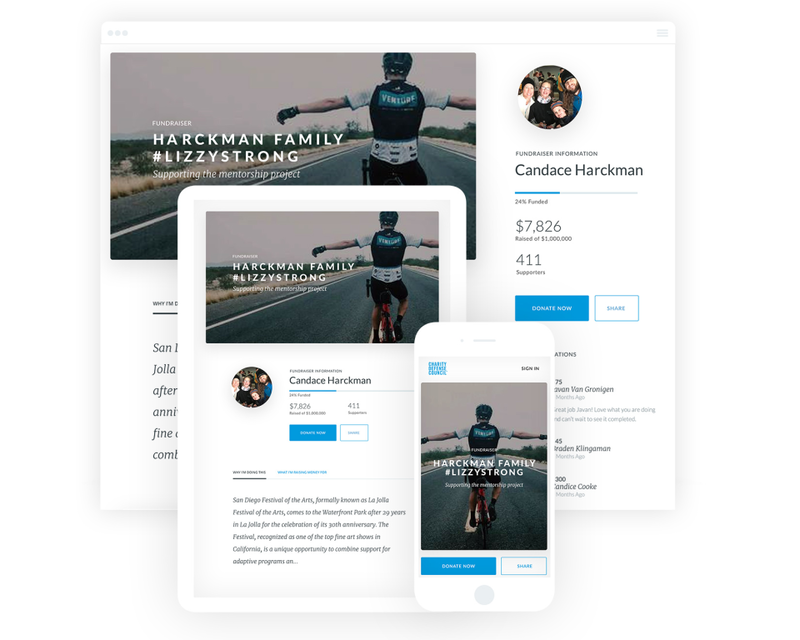 It has a beautiful, simple layout for donors to utilize. Furthermore, it only costs a fraction of the price some its competitors charge. Overall: Donately has allowed us to receive donations for our non-profit arm of our organization. Cons: Campaign pages - the formatting options a minimum. Overall: As a startup nonprofit, Donatello helped us provide an avenue to secure funding easily with easy plugin integration. The small processing fees can't be beat which keeps our administration budget low (which everyone loves). The customer service is quick and personal. The only negative I've found is the campaign pages are limited in their design ability, which can also be a pro for those with little experience in design and coding. Great donation tool for non profits! Pros: I like that it is stripe based. I like the campaign fundraising tools although we have not yet used it. Cons: Wish the styling was better. Or at least easier to understand what to do with CSS on the back end. A video tutorials would be fantastic. Overall: The dashboard and setup is very functional and intuitive. Integrations are very helpful as well. Makes managing new and reoccurring donations a snap. What I wish this platform had is better styling options as I am not very good with CSS. Sometimes it's not as mobile responsive when embedded in a pop up. As with anything more integrations would be great. Keep up the good work. Recommendations to other buyers: Keep adding features, integration and making functionally easier. Other platforms are coming in on this market. Comments: Donately provides an intuitive and easy to use platform that integrates well with our website. I've rarely contacted their customer service which is a testament to the ease of their product, but when I have my questions have been answered swiftly. Their backend is organized well and it is easy to find the information that you need. 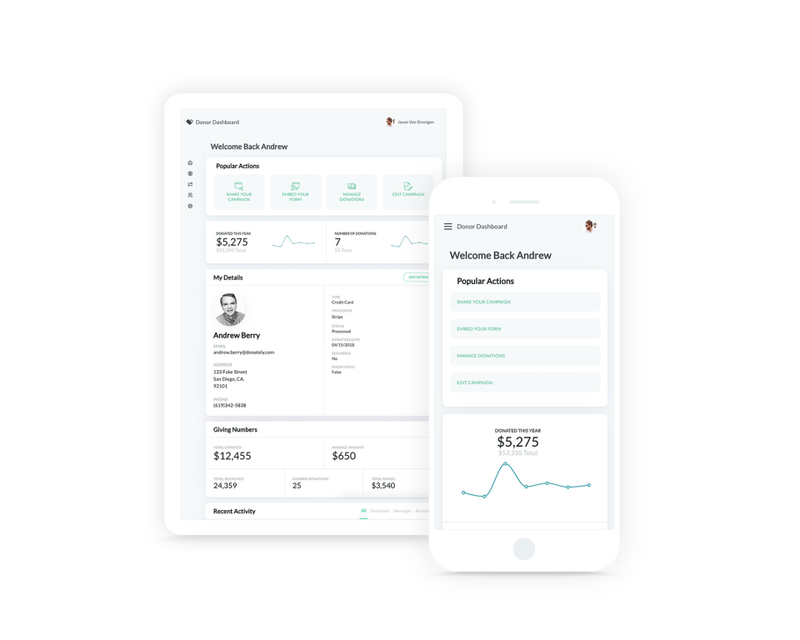 The one downside we have found so far is the financial reporting when connecting through third party apps like Stripe to Xero is less organized but not difficult to figure out. Overall we are really happy with our experiences with Donately! A great fundraising platform at a great price that scales with you! 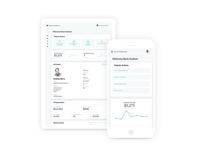 Comments: I've worked with several start-up organizations over the past couple years and found that Donately fits the goal every time for those org's that need a professional and functional platform that is priced to scale with you. 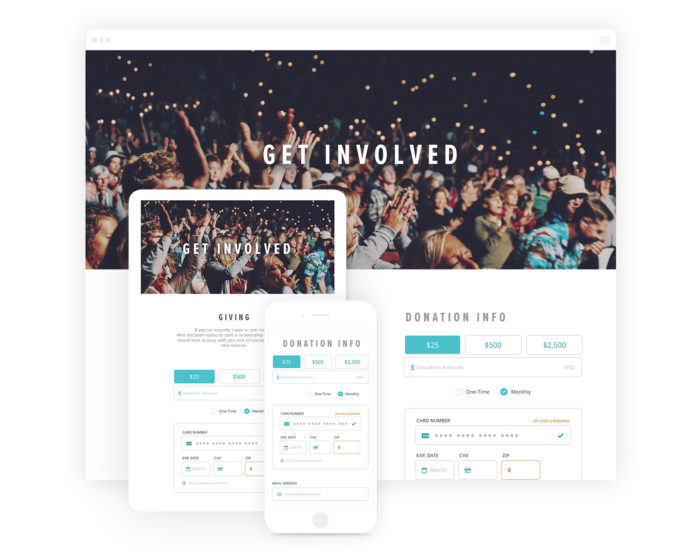 It seems that the creators of Donately get what most nonprofits need with easy-to-create donation forms that are responsive, embed into Wordpress, and equipped with peer-to-peer campaign functionality. Thank you for a great platform at a great price! Recommendations to other buyers: Perhaps an email sign-up check box in the donation form for Mail Chimp would be useful? Overall: I used donately to throw up a donation box with recurring payments that looks better and loads faster than PayPal's option. Service fee of ~2% for ease of use is reasonable. Will use on any website looking to take donations. Overall: Been using Donately as our main platform for about 3 years (on and off). We love the potential with it but it is hard to be fully utilized unless we have someone with tech skills on the team to develop it.